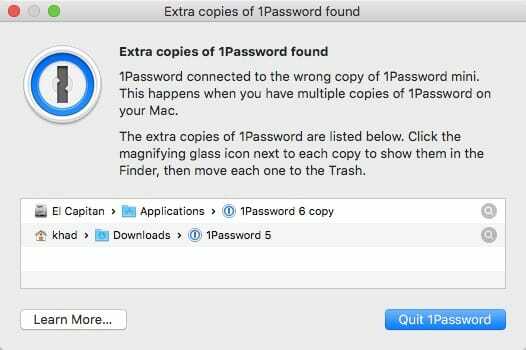 1Password found more than one copy of 1Password on your Mac. 1Password failed to connect to 1Password mini. 1Password connected to the wrong copy of 1Password mini. It’s safe to remove extra copies of the 1Password app from your Mac. Moving the extra copies to the Trash will not affect your vaults, saved data, or settings. Be wary of using an uninstaller app like AppCleaner, AppZapper, CleanApp, and other similar apps. Uninstaller apps prompt you to delete supporting files when moving an app to the Trash, and this can result in accidentally deleting all of your 1Password data. The extra copies of 1Password are listed along with the message. Click the magnifying glass icon next to each copy to show it in Finder. Then move each one to the Trash. Extra copies of the 1Password app on attached backup drives can cause the same problems as copies on your startup drive. You should continue to back up your 1Password data (found in your Application Support folder). However, you should exclude the 1Password app (found in your Applications folder) from backups. If you ever need to, you can restore your 1Password data from your backup, and the 1Password app from our website (or the Mac App Store if you purchased it there). If you remove the extra copies and 1Password still can’t connect to 1Password mini, try these additional steps. If you tried the steps above and still can’t get 1Password to work, email us a diagnostics report from your Mac. Any additional information you can provide will allow us to resolve things as quickly as possible.